In Europe, principally Britain at first, the Industrial revolution was in full force by the beginning of the 19th century. As coal power and later steam power began to drive factories and mills, people started moving from the country to the cities to find work. As the country villages emptied, the brick and stone masons, carpenters and tradesmen moved with them to the growing urban developments. Railways allowed for this migration and changed virtually overnight the social and economic structure of society. In Canada, the impact of the train service from coast to coast cannot be underestimated. It fueled the growing businesses of lumber, wheat and cattle as well as allowing immigrants, first - second - and third generation - to move freely across the country and build their own futures. In the early 18th century most people and goods traveled by horse drawn wagons and coaches. By 1776 iron rail lines were being built throughout England for wagons drawn by horses. By 1821 there were passenger trains in Britain. Train stations began to be built to shelter the people and goods as they awaited the trains. Most railway stations were built between 1800 and 1850. They were made of cast iron and glass. 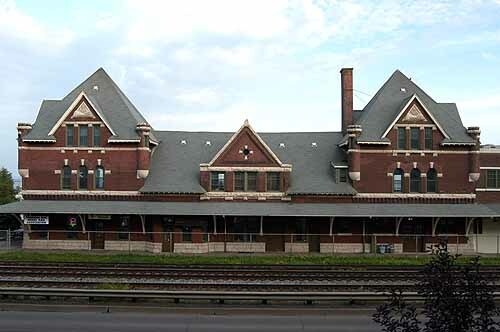 Accustomed to designing buildings either in the Classical or the Gothic/Medieval tradition, most designers developed railway stations that were indistinguishable from other civic buildings. The battle of the styles began when railways, footbridges, brackets, trusses and cantilevers were made to look ornamental. Classical units such as entablatures, columns, capitals, fretwork and egg and dart were transferred directly to the new medium. The development of train stations was directly defendant upon the new processes of steel and plate glass. Reduction of iron ores by carbonaceous fuel directly to a steel composition was practiced in ancient times, but liquid processing was unknown until the development of the crucible process, in which iron ore, coal and flux materials were melted in a crucible to produce small quantities of liquid steel. Modern steel making processes began with the invention of the airblown converter by H. Bessemer in 1856. - Bessemer Process. This lead to quicker, safer production of rail lines as well as train stations and platforms. Prefabrication became the norm and the role of craftsmanship changed radically. Instead of craft firms and guilds, the large new building enterprises required large building contractors who coordinated the construction and delivery of materials. Because people were forced into more confined quarters, the technical services such as heating, ventilation and sanitation were also revolutionized. Gas lighting was introduced in 1809. In 1801 Volta showed Napoleon how electricity could be produced from a battery. By the 1880s electricity was available to anyone who could afford it for either residential or commercial applications. People were both frightened and fascinated by the changes taking place around them. Exhibitions, intended largely for (and to impress) the middle classes were a 19th century phenomenon. Large exhibition grounds and buildings could be found in most large cities. Like today's "Home Show" or "Automotive show", this is where people found out about, and were sold, the new modern technologies. IN Canada, these developments came slowly. 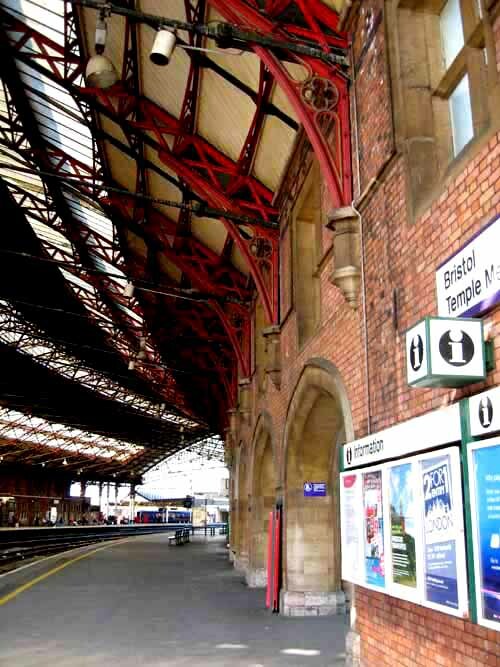 The larger train stations mimicked those of Europe while the smaller ones were made in a Victorian tradition. St. Pancras Station in London serviced the Midlands and perhaps more importantly, provided 20 percent of London's coal and a great deal of London's beer. 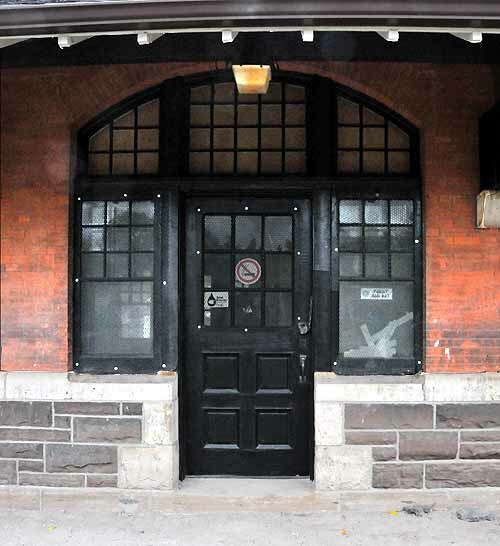 A brewery was found on the basement level of the station. George Gilbert Scott was chosen as the designer because his was the most impressive façade. His was also the most expensive at , £315,000 but the Midland Railway directors were interested in getting an impressive railway station before the second huge International Exhibition in London in 1862. St. Pancras Station has some of the best examples of Victorian Gothic brickwork in the world. Here we have a set of paired lancet arches done in dichromatic brickwork for the voussoirs. The capitals are Late/Gothic Renaissance floral patterns with a large abacus. The column shafts are marble. In the background are trefoil arches with impressive impost blocks. While the platforms and public areas in the interior of the station are revolutionary in their use of space and materials, the exterior resembles a castle with turrets, castellation, iron cresting, and many traditional civic medieval details. While the exterior of the Temple Meads Railway Station in Bristol resembles a medieval castle from the exterior, the materials used to build it and the platforms themselves are radically different from anything done before. The main railway building is brick with stone detailing. This is then attached by cast iron ribs to iron joists along the ceiling. Between the joists is glass. The detailing of the stone and brickwork is medieval. The largest center east of Toronto is and has been for almost a century, Ottawa. Like Toronto they had a magnificent Beaux Arts train station right in the middle of the city. Politicians being what they are, decisions were made in the 1960s that placed the train station outside of town and all the tracks were taken out. At least the building was not ruined. All across the eastern side of Ontario small towns were united by a web of train lines that allowed farmers and rural dwellers access to other markets and larger city centers. Now many of these tracks have been abandoned and pulled up. At least the train line clearings can now be used for cycling and cross country skiing. 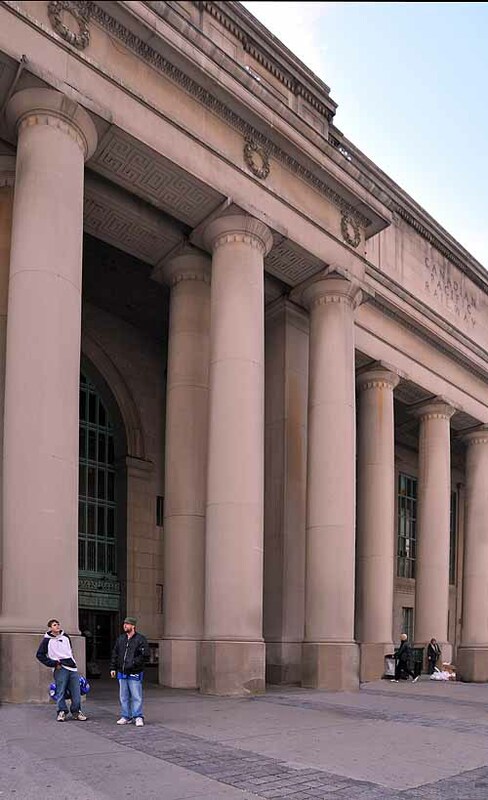 A stunning Beaux Arts train station equaling the grandeur of Toronto's Union Station sits in the middle of downtown Ottawa. A couple of good blogs will explain why it is now used as a convention center. It is still a stunning building with Tuscan columns, an impressive attic story and a wonderful marquee. As the railways connected the various urban centers across Canada, a series of gorgeous hotels was build by Canadian Pacific Rail company. 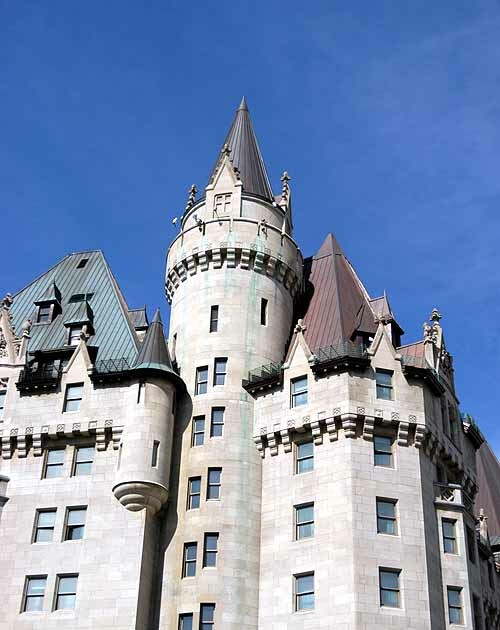 Château Frontenac in Montreal, Chateau Laurier shown here, Chateau Lake Louise in Lake Louise are just a few of the first class hotels constructed in the Chateau style. Large city centers such as Toronto and Hamilton had impressive buildings done in the European revival styles. Smaller train stations were done with vernacular materials and craftsmen. The carpenters used exaggerated bracing and lamb's tongue brackets to support the necessarily large overhangs. Roofs were low and unprepossessing. 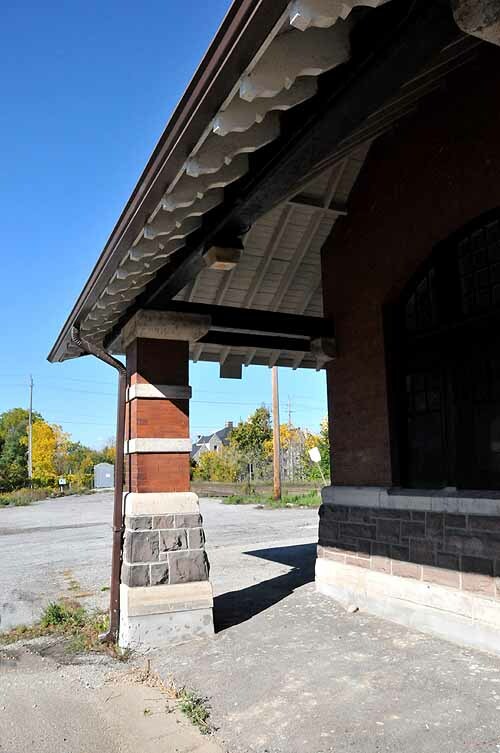 Many Ontario towns have noted the value of their historic train stations. While many are no longer in use as train stations, people have bought them and turned them into restaurants or gazebos, or they are part of parks and community centers. The Markham train station was a Victorian beauty. It has been completely restored and is now used as a gazebo in a public setting. Anyone who loves wood working will love this detail of the brackets and finials. 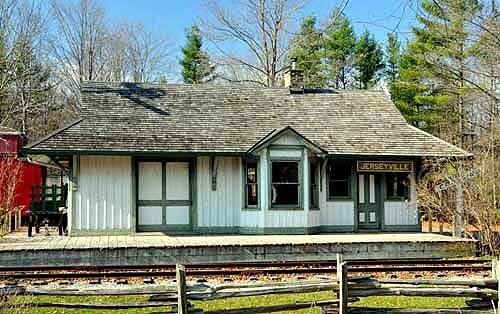 The Jerseyville train station was perhaps the first of the disappearing train stations to be rescued. Two retired teachers thought it was worth preserving, so they had it dismantled, bought some land just west of Hamilton, and reconstructed it. This building was the first building in a reconstructed 19th century town called Westfield Village. 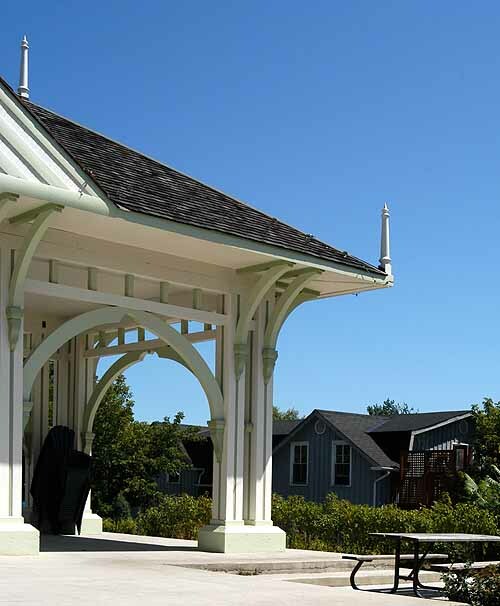 If you are interested in Ontario's heritage architecture, the knowledgeable staff and volunteers at Westfield have made a startlingly good complete town that offers many seasonal attractions and festivities as well as the perfect setting for a wedding or other grand event. 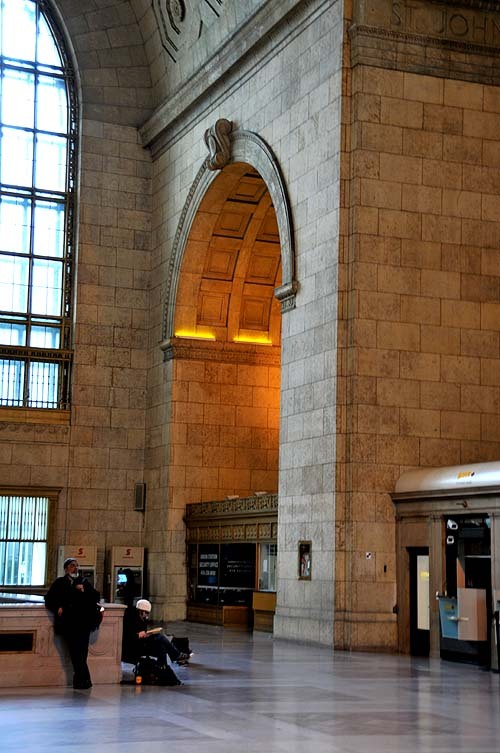 Union Station is one of the best preserved Beaux Arts buildings in Canada having just been restored to it's original glory. John Lyle designed this building after studying the Baths of Caracalla. The interior is a wonderful mixture of Roman stone columns and barrel vaults with Art Nouveau style metal grills. You can't help but feel overwhelmed at the grandeur of the station walking through the massive barrel vaulted doorways. Every detail of the building is coordinated and fits perfectly. You can wonder why the building housing the newest and most revolutionary technology to date - the train - was housed in a building fashioned after a 2000 year old bath house, but you can't say it isn't gorgeous. An ornate metal grille housed within a Roman arch seems somehow normal under the circumstances. True to Roman form, the column capitals are Tuscan outside the building and Corinthian within. Octagonal coffers frame the opening for the windows. Clerestory windows help to illuminate the coffers in the barrel vault which spans the length of the building. Now a banquet center, this grand facade was the next stop on the TH&B line - Toronto, Hamilton ad Buffalo. It has also been used in a wide variety of movies. Acroterions are found on the corners of the aedicules in the Acropolis. Here they decorate the front facade of the train station. An aedicule is a door surround or window surround done in the Classical manner with engaged columns or pilasters, an entablature, and a pediment. Again we look to the Acropolis in Athens for inspiration on proportions and detailing. Here the frieze states the purpose of the door - access to the Express lines. 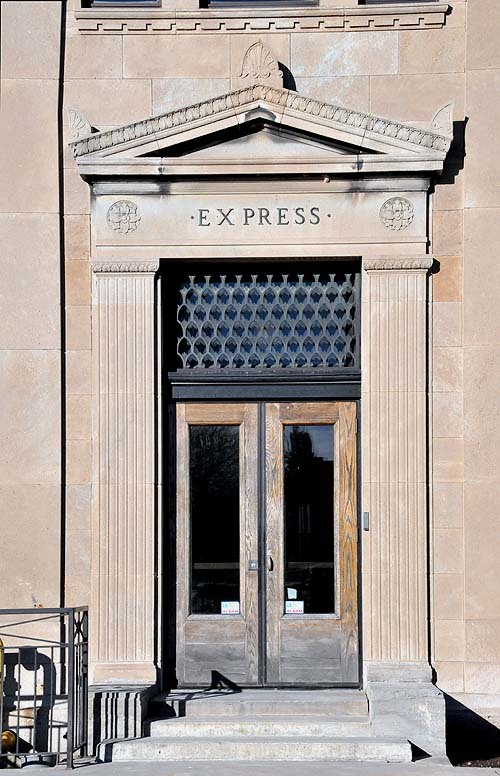 Liuna Station, like the old Post office building in Hamilton, is known for its remarkable bas relief. The theme is travel, trains, boats, planes and automobiles. 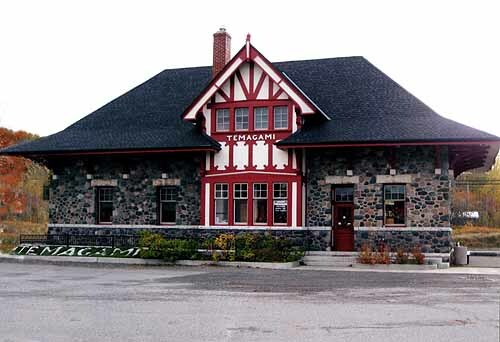 The Guelph station is one of many fine Arts and crafts style stations. 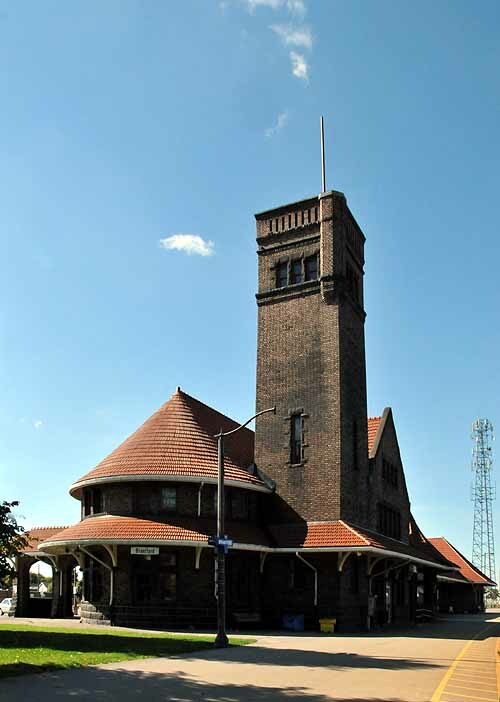 Done in vernacular brick with a tall central tower, this station is inviting and solid. The lamb's tongue brackets under the soffits are extraordinary. 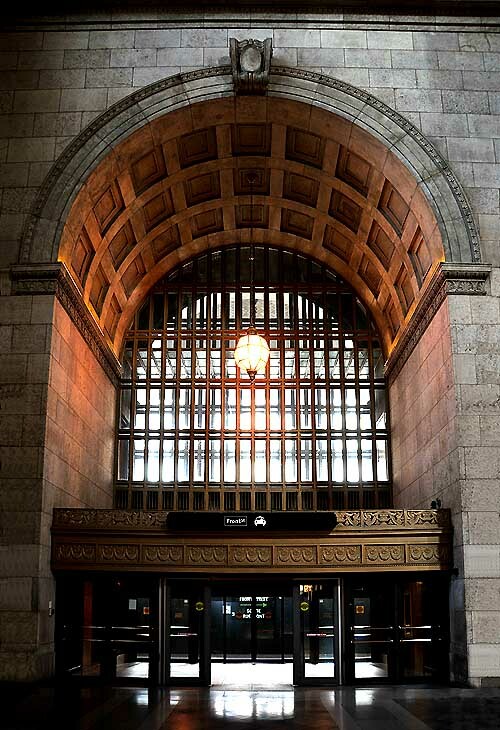 Here is a rare example of a restored late Art Deco train station. The counters, wall finishes, tilework, even the bathrooms are true to the original. Hamilton really got it right this time. The sleek lines and wonderful sweeping corners of this building are classic Art Deco. The chrome wings holding up the rod on the top of the building are a wonderful accent to the clean ashlar finish of the north facade. These benches are all new but they are built with an Art Deco sensibility. Heading across western Ontario the trains were used to bring lumber and wheat from the prairies and forests of Northern Ontario. As communities grew, trains became more stylish. Definitely one of the finest Arts and Crafts train stations in the world, the brantford train station is as much of a gem as the city itself. An oversized portico allows people to disembark from carriages and later cars without getting wet. The tall tower is a useful addition for communication between stations. The roofline underneath is stunning. Impeccable craftsmanship was standard in all the train stations. For those who have done any wood working, imagine putting in the curving tongue and groove soffits. Galt is also known as one of the best Arts and Crafts train stations. Lamb's tongue brackets support the overhang. Rafters are open with tongue and groove finish on the underside of the roof overhang. Notice how the rafters are embedded in the brick. The door surround is also unique. Many train stations in the north are being shut down due to underuse. Sadly this was the only link that some people had with distant family and friends. Hundreds of miles west of most of the other settlements, Thunder Bay was the connecting point for goods from the Prairie provinces and markets in the east. The economic surge of the late 19th early twentieth century led to wonderful residences as well as this impressive and very large At=arts and Crafts Train Station. Built in 1905 by the CNR, this lovely gable end has a crest in the inset gable, two tourelles made in the medieval manner. Another Arts and Crafts gem, this has a central half timbered bay within a rustic river stone building. The South HAmpton station was used for a few years as a restaurant. It is also constructed in the Arts and Crafts style. Notice the lamb's tongue brackets and generous eaves similar to Brantford and Guelph. Cruickshank, Tom, and John de Visser, Old Toronto Houses,Toronto: Firefly Books, 2003. Cruickshank, Tom, and John de Visser, Old Ontario Houses,Toronto: Firefly Books, 2000. For information on Gothic Revival architecture in specific areas within Ontario there are some very good books listed under the About page.